In Mumbai, the traditional method of paying Challan will soon cease once Mumbai Transport Department is scheduled to launch the e-challan system in January-February 2016. The main goal of the e-challan system is to reduce traffic violations, misconduct and settlement costs. Mumbai traffic police will begin issuing e-challans to offenders caught on camera using surveillance network. The key idea behind the digitization of the Challan system is to abolish cash transactions for the collection of fines in a traditional way. The CCTV cameras capture license plates of the traffic offenders, therefore, with information captured in CCTV cameras, the details of the vehicle owners will be issued from the regional RTO and E-Challans will be the addresses to RTO upon registration of the vehicle. As a primary part of the vehicle address and owner details (which are registered before 2006) are collected by the traffic police and the RTO was directed by the court to help the traffic police in this regard within a span of six months The city vehicles information in the Database and when it is recorded in CCTV camera by violation of traffic rules e-challan will be issued to registered vehicle users. Mumbai Transport Department is scheduled to slow the handling of cash by traffic Constables slowly. In general, to reduce the payment of the full penalty, infringers pay a lesser amount of cash and do not take any coupons and get away. Even if a traffic infringer pays and takes the voucher, the handling of the money has its own cost. This penalty money must be submitted to the cash desk, which then has to count it before paying into banks. All these operations are lengthy and require money and personnel. With this e-challan system, these activities can be reduced and the money saved by the department used for other development purposes. Mumbai Traffic Police has not an online e challan system for checking traffic police and challan status and paying traffic e challans. 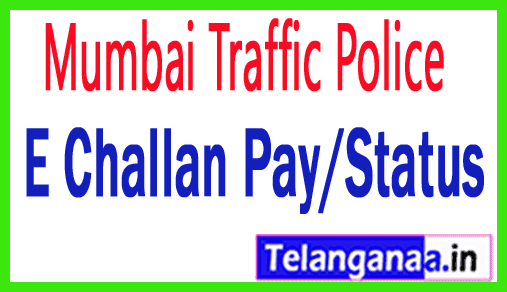 Traffic police in the big metro cities like Mumbai traffic police has gone a step and most of them have introduced traffic echallan on-line system of checking and paying traffic e Challan.